Head cattle wrangler, fence mender, chief butcher, master sausage maker and all around great father and husband. Joe has been perfecting chemical free sausage recipes and curing techniques for over two decades. We call him the "Spice King." But he just refuses to wear the Elvis outfit when he's working. Darn. Joe is an accomplished horse trainer and has trained our horses to use on our ranch for herding cattle and farm management. He was a rodeo cowboy who spent a considerable amount of time on the back of a bull or steer wrestling, otherwise known as bulldogging. Thankfully he did make it out of that in one piece, although there were a few very close calls. Joe is about as close to perfect as a mortal man is allowed to be and we love him so much! I met Joe through a mutual friend when he was a dreamy rodeo cowboy (he still is quite dreamy). After we were married we dreamed of owning a ranch where we could raise horses and run cattle and raise our daughter. We started from Tacoma and kept working our way out until we found a place we could afford. We wound up in beautiful Mossyrock with wonderful neighbors. 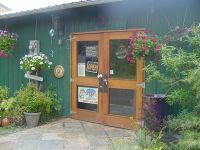 We opened Salmon Creek Meats in 1998. If you build it they will come. I worked outside of the business on a paving crew while we built up our clientele. After five years I joined Joe working full time in the business. Living where we are; farming and ranching and raising our daughter in a healthy environment has been a pure blessing. Our daughter just turned 26. Joe and I are very proud of the kind of person she has become. Being able to have access to healthy meat, raised in an ethical manner is a privilege that we want to share with others. Bobby grew up with Joe on their family farm in south Tacoma. He spent nearly his whole life with his brothers Joe and Lee working at the Meat Shop of Tacoma. The Meat Shop of Tacoma was founded by their father, Bob Markholt, and their Uncle Lee Markholt. Bobby is precise and skilled. We sometimes tease him and call him "the Ginsu Chef," particularly when his knives blaze with lightening bolts. Phew!! He is great to work with and we are lucky to have him on our team! Uriah is our daughter and we are very proud of her. She recently graduated from Centralia College and is planning on a career in Equine Sciences. Her eventual goal being to run a retreat using horses as therapy for children with special needs. Currently she is working with us for the season and we are so glad to see her bright shiny face every day and value her skills as a specialized meat wrapper. Derek has is an invaluable member of our crew. He is patient and kind and a good listener. He is our resident fisherman, hunter and throw him on the back of a horse madman. Though he did not grow up on the back of a horse he is a natural and helps Uriah and Joe when they are rounding up cattle. He is instrumental in the meat cutting shop as well as taking care of the farm. We are lucky to have him.